Although the listing I received cited Maple Grove Cemetery as being in or near Napoleon, I find no such cemetery. The cemetery given here is in Concord, another unincorporated place over 24 miles to the west. Before traveling to this cemetery, it is advised to do solid research to avoid arriving at the wrong cemetery. There are quite a few other cemeteries with this name in Michigan, but I find none near Napoleon looking by map. Some examples: Maple Grove Cemetery in Mason, MI; Maple Grove Cemetery in Mattawan, MI; Maple Grove Cemetery in Mullet Lake, MI, Maple Grove Cemetery in Ovid, MI, and undoubtedly others. If you know a location for a Maple Grove Cemetery in or near Napoleon, please contact me to change this listing's information (couchdouglas@aol.com). That said, the Maple Grove Cemetery listed here, which seems nearest to Napoleon, is in Concord, 15 miles west by southwest from Jackson, following Route 60, which is Spring Arbor Rd which is also E. Jackson Rd. and becomes W. Jackson Rd. at the N. Main St. turn-off in Concord. 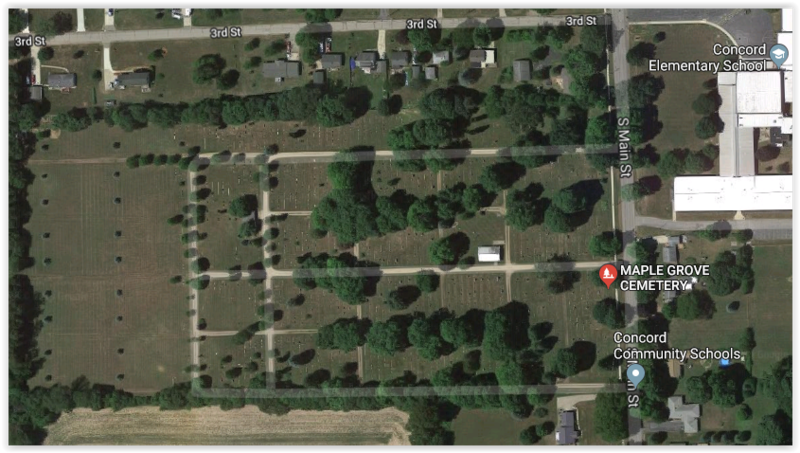 As you go south through Concord, the cemetery is on the west side of S. Main St. south of 3rd St. and is easily visible from S. Main St.